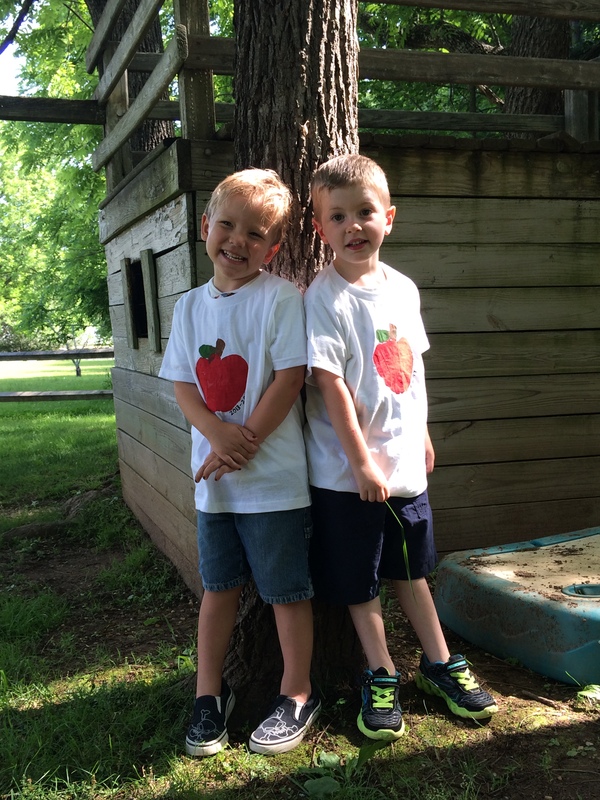 The Red Apple Schools, Inc. | A developmentally oriented preschool and kindergarten program. Welcome to the Red Apple Schools Website! 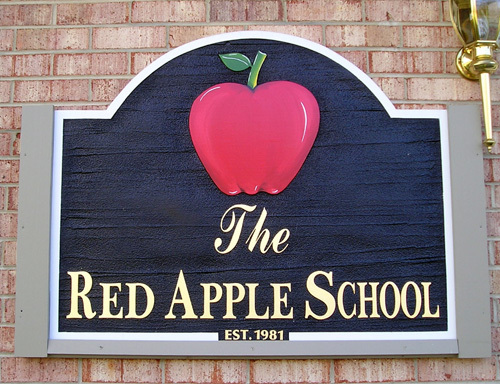 The Red Apple School is locally owned and operated. Rated #1 Preschool in Stafford, Prince William & Fredericksburg and a Top Northern Virginia Preschool by Northern Virginia Magazine since 2008! A school year program since 1981. Registration for the 2019 – 2020 school year is now open. We are closed most of June and July. Our Countrywood campus is open some mornings during the summer for visiting purposes. Please email us for further information. Emails are usually responded to within a few hours during the summer months. * Licensed By the Commonwealth of Virginia to assure safety. * PALS – Phonological Awareness Literacy Screening provided by the University of Virginia for Kindergarten. * NACCRRA participation to support families with deployed military. * Partners with Stafford County Public Schools, New Beginnings and other community organizations involved in quality early childhood education. RED APPLE SCHOOLS ARE LICENSED to operate by the Commonwealth of Virginia. 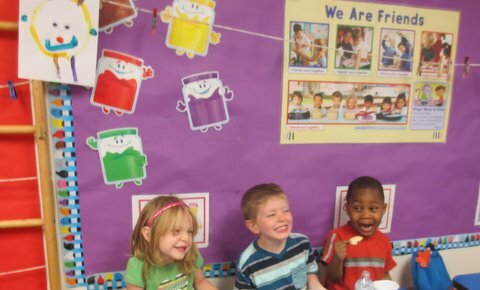 Every preschool in Virginia is entitled to be licensed by the Commonwealth. Some are permitted, but not required, to opt out with a special exemption that allows them to operate outside the recognized standards of the health and safety set for young children. Be sure to check when you visit schools. Standards for Child Day Centers in the Commonwealth of Virginia can be downloaded from the Internet. All licensed schools have surprise visits from early childhood licensing specialists to provide assistance, guidance in updated information and ensure that schools are providing a healthy and safe environment for our young children. Young children are precious and new in our world. Please make sure they are in a safe environment. 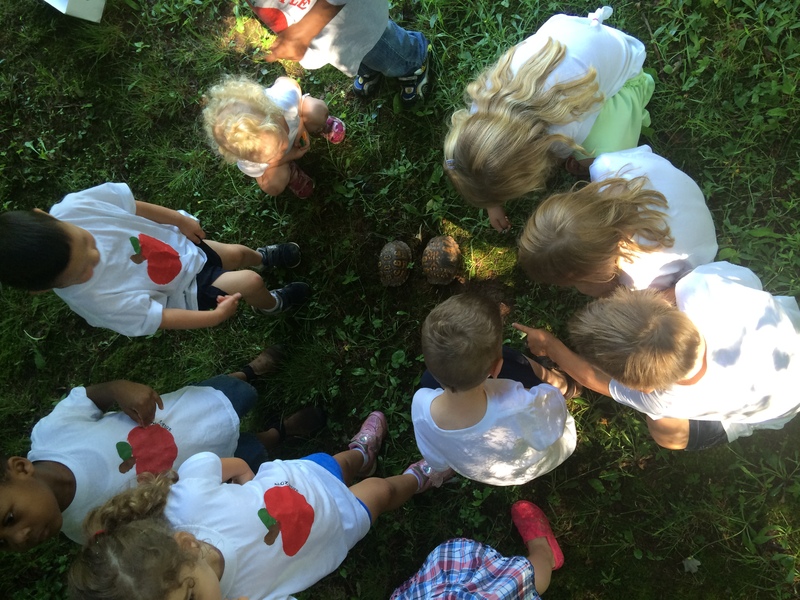 Red Apple has been nationally accredited since 2008 by the National Early Childhood Program Accreditation. Accreditation validates that we meet the highest standards in curriculum, programming, staff qualifications, health, safety and our environment. With accreditation we are recognized by the Virginia Department of Education. All preschools may apply for accreditation if they are willing to meet the high standards required. 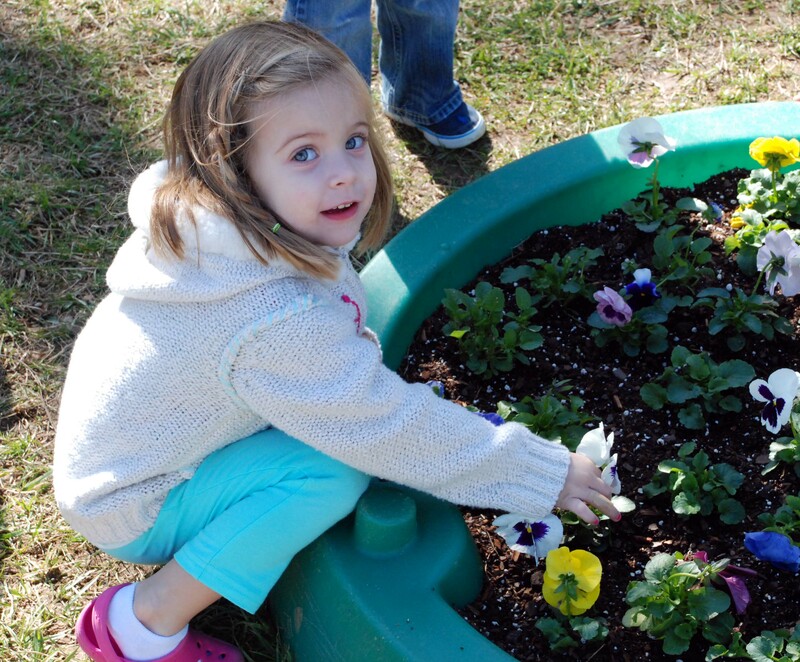 We have professionally trained staff in the Early Childhood Environmental Rating Scale. 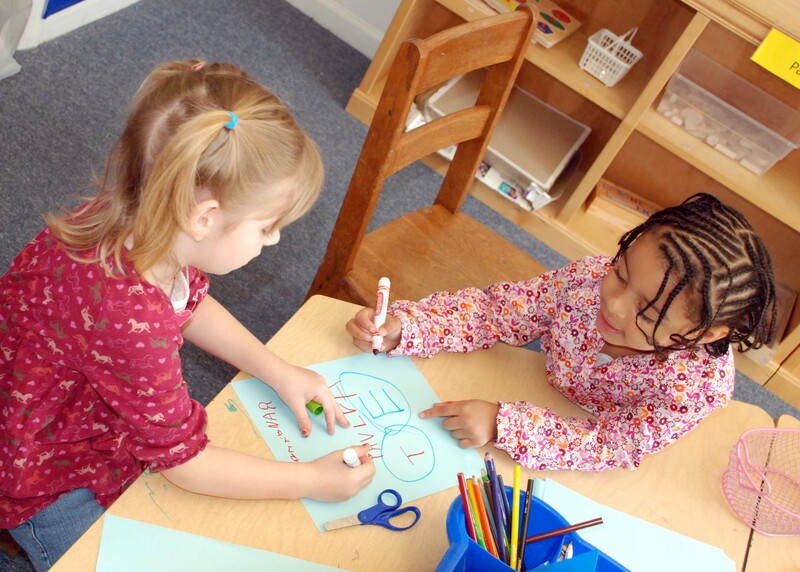 ECERS-R is designed to assess process quality in an early childhood group. “Process quality consists of the various interactions that go on in a classroom between staff and children, staff, parents, and other adults, among the children themselves, and the interactions children have with the many materials and activities in the environment, as well as those features, such as space, schedule and materials that support these interactions. Process quality is assessed primarily through observation and has been found to be more predictive of child outcomes than structural indicators such as staff to child ratio, cost of care, and even type of care, for example child care center or family child care home” (Whitebook, Howes & Phillips, 1995). Our school evaluates and incorporates the standards set by this rating scale to provide a quality environment for young children. Established in 1981 by Nancy Bjerke, a certified teacher with degrees in early childhood education and social sciences, the Red Apple-Countrywood was founded as a developmentally oriented preschool program with a curriculum designed around early childhood readiness skills. 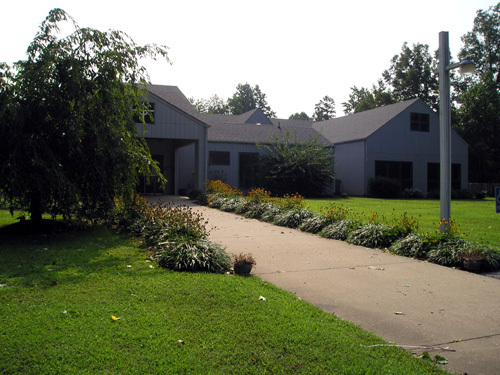 In 1990 our program expanded into the Summit Presbyterian Church. (The Red Apple – Summit). Nancy continues to work in the Red Apple as Head of Schools. Our school employs professional, educated, early childhood teachers who participate in ongoing education and training to maintain a program that reflects current and proven early childhood methods. The Red Apple is a private day school specifically designed to assist in the development and readiness of the preschool, pre kindergarten and kindergarten child. We offer morning and afternoon school programs from September through mid June. Summit offers a three hour program with extended day available on a drop in basis until 2:00. Countrywood offers an extended preschool day from 7:30 a.m. until 5 p.m known as Cheetahs. We follow the Stafford County Schools’ calendar. Our Red Apple–Summit provides classes for 3 hours per day. (9:00-12:00) There is an extended day program until 2 p.m, known as lunch bunch. Our classrooms in this location are shared with the church. Our teachers are professionals who are outstanding at providing a fully balanced preschool program in shared space. Each class and teacher uses three center rooms on a daily basis. This allows our small classes to receive close individual attention and immerse themselves in various well defined and developed curriculum areas that include the Language Arts Center Room / The Math, Science and Engineering Center Room and The Fine Arts Center Room. Although we are located in a church facility, we are an early childhood education based program. This site is exclusively a private child day school. The lowest level, entered from the sunroom on the ground floor, is our three year-old class and our four year-old Language Arts classroom. 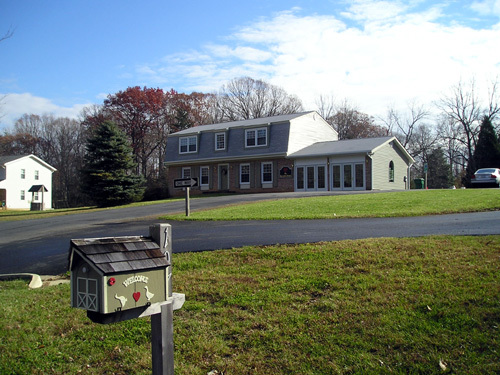 The middle level, entered from either the front or upper back door, provides our four year-old Math, Science and Engineering Center room (STEM) and our Fine Arts Center Room. While center rooms are available for kindergarten use, they also have a self-contained classroom on this level to further academic pursuits. The top floor provides a staff room and resource library, Principal/Director office, a large equipment and materials room, a storage room, and an adult bathroom. Extended day begins at 7:30 a.m. until classes start at 9:00. After school ends, children may schedule to stay until 5 p.m. We encourage drop ins to make reservations 24 hours in advance unless there is an emergency. Should you need later care, please email our administration. If we have enough children, we will extend the hours. Our program addresses all developmental areas: social, emotional, physical and intellectual. We have small classes, usually between 5 to 10 children with a degreed and/or certified teacher experienced in early childhood education. Our teachers usually plan and prepared in a team of three so our children benefit from the knowledge and skills of three early childhood professionals. However, each class of 5-10 children have their own teacher that remains with them throughout the preschool day. Our program is unique in that our children visit three professionally designed and developed center rooms on a daily basis with their teacher. These rooms are the Language Arts Center Room; the Math, Science and Engineering Center Room (STEM) and the Fine Arts Center Room. Each of the team teachers selects one of these rooms to maintain and develop throughout the year. In this way, the teacher is able to fully concentrate and develop one area of curriculum within that center room, preparing it for the other classes to enjoy. The children reap the benefit of three professional teachers developing stimulating, challenging and changing activities throughout the year but continue to benefit from the close, individual attention provided by a small class. We know that small classes give children more opportunity for guidance and interaction with the teacher but we also know that it is important that children be prepared to function in a larger grouping. To provide these skills we have a daily large group time full of music, stories, movement, and many fun learning activities where children learn to listen, share, laugh and work within a larger group. Our schools are located in country settings that allow for our outdoor emphasis on nature. Grasses, tree varieties, flowers, gardens, mud, sand, stones, local birds and animals, seeds, nuts, branches, fruit and all aspects of nature surround our facilities to allow for nature, observation and gathering walks. There are areas to run, pretend, tag, chase, observe, experiment, collect and enjoy the outdoor world. Our man made equipment is selected specifically to be developmentally appropriate and safe for the preschool age child but our outdoor emphasis is the natural world around us. Our teachers plan weekly outdoor activities to enhance our curriculum with the natural world and develop large motor skills. Our playgrounds are inspected daily for safety. Red Apple offers varying types of technology including computers and tablets. However, use of this equipment is limited to specific and special learning opportunities. The American Academy of Pediatrics has urged parents to limit the time young children spend on this equipment and the potential results of excessive use are under study. Young children are learning and developing rapidly in all areas and it is important that we provide an environment that is conducive to this growth. While we believe children should have opportunities with this equipment in a school setting, we know young children learn best from their interactions with their teacher, peers and environment. Overall, our concentration is on social, emotional, physical and intellectual development and school readiness skills. This includes including letter recognition, phonics, rhyming, sound awareness, stories, print and word awareness, pre-math and math skills such as shapes, attributes, sets, number recognition, counting, patterning, location in space, number value, vocabulary, building, inventing, creating, science observation and experimentation. We develop fine motor skills, music awareness, creative art, pretend play, outdoor and indoor large muscle activities and skills too numerous to list here. We use a variety of outstanding tested resources for curriculum development. We encourage fun learning in a warm, welcoming, child centered environment where children become happy, confident learners who are well prepared for grade school. Red Apple tuition may qualify for dependent care credit with the IRS if you work. See Publication 503, pg 6.